Approximately 215 million Christians experience high, very high or extreme persecution for following Jesus. 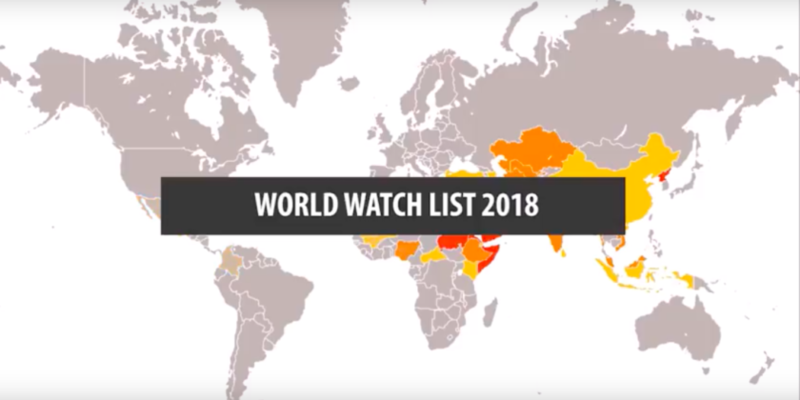 Nearly one of every 12 Christians in the world lives in an area, or in a culture, in which Christianity is illegal, forbidden or punished, new World Watch List by Christian foundation Open Doors denounces. Every day, six women are raped, sexually harassed or are forced into marriage to a Muslim under threat of death due to their Christian faith. Research for the World Watch List documented 2,260 such incidences against women—and this number only covers those who had the courage to report such an incident, representing only a fraction of those actually raped and harassed in this way. Throughout this year, we’ve shared numerous stories of women, such as Debora in Nigeria, Rana in Iraq and Workitu in Ethiopia martyred for her faith, who have experienced dual persecution because they 1) believe in Jesus and 2) because they are female. Once again, North Korea claims the number 1 spot–for the 16th consecutive year. With more than 50,000 Christians in prison or labor camps, the ranking comes as little surprise for the totalitarian regime that controls every aspect of life in the country and forces worship of the Kim family. Other countries where persecution increased the most are also India, Libya, Kazakhstan, Tajikistan and Turkey. Pakistan saw the most violence recorded against Christians and Islamic extremism remains the global dominant driver of persecution, responsible for initiating oppression and conflict in many of the countries analysed by the charity foundation.